This is a long weekend, so stock up on trackbacks to get you through. 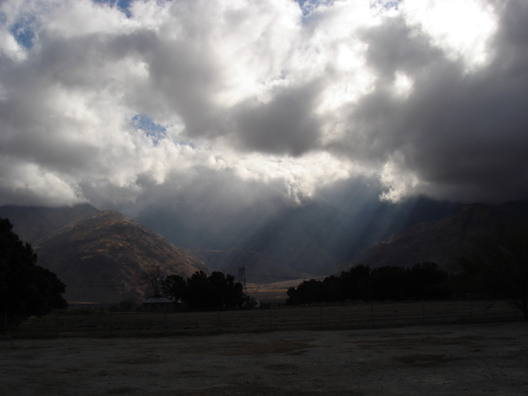 I took this picture about a week ago near Whitewater, CA. Trackposted to Right Pundits, Outside the Beltway, Perri Nelson's Website, The Virtuous Republic, 123beta, Right Truth, Maggie's Notebook, basil's blog, Shadowscope, Stuck On Stupid, The Bullwinkle Blog, Cao's Blog, Phastidio.net, Diva Dish - Weekly Celebrity Gossip Round UP, Conservative Thoughts, Pursuing Holiness, Rightlinx, Faultline USA, third world county, The HILL Chronicles, Woman Honor Thyself, The Uncooperative Blogger ®, The Crazy Rants of Samantha Burns, stikNstein... has no mercy, The World According to Carl, The Right Nation, and Pirate's Cove,Outside the Beltway, The Virtuous Republic, Is It Just Me?, A Blog For All, Adam's Blog, Maggie's Notebook, Big Dog's Weblog, basil's blog, Cao's Blog, Jo's Cafe, Conservative Thoughts, Sujet- Celebrities, Allie Is Wired, Faultline USA, Wake Up America, Blue Star Chronicles, The Pink Flamingo, Gulf Coast Hurricane Tracker, Dumb Ox Daily News, Right Voices, and Gone Hollywood, thanks to Linkfest Haven Deluxe.